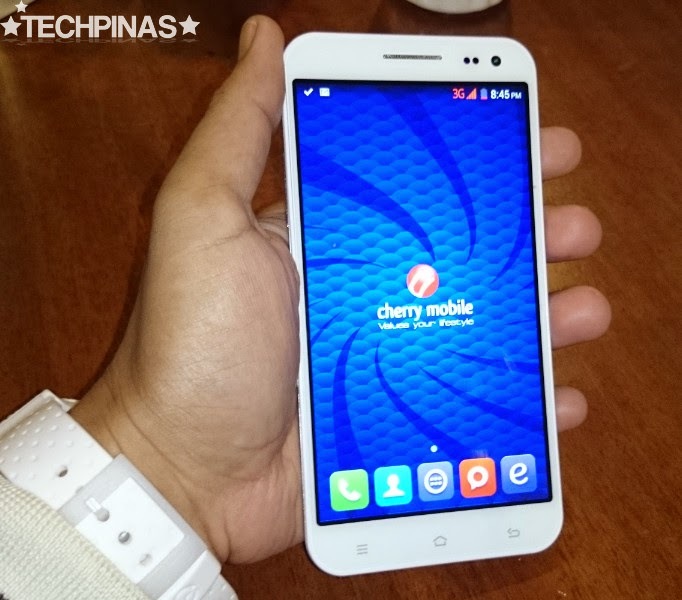 Cherry Mobile truly has a lot to be grateful for. 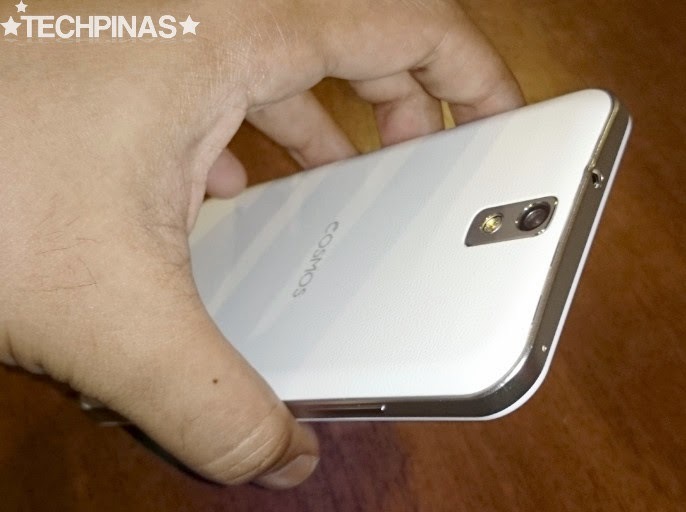 In just a span of five years, the Pinoy electronics company has grown to be the local brand to beat in the handset and tablet category - at least, in terms of sales - and it's not showing any signs of slowing down. From having only a small selection of feature phones back in 2009 - pioneering the use of Dual SIM Dual Standby capability - Cherry Mobile now offers more than a hundred value-packed devices - across various price categories - nationwide. 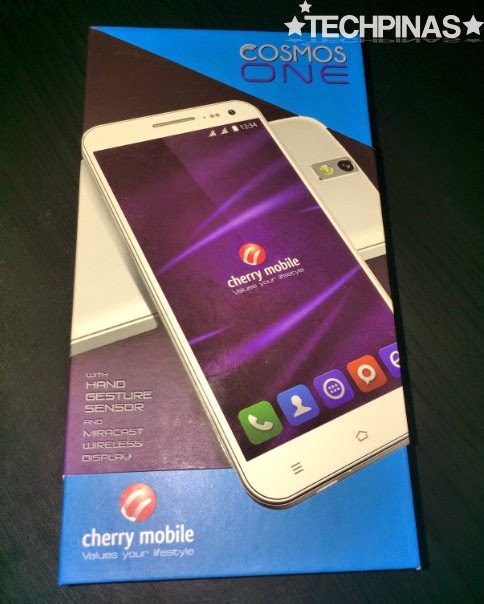 In celebration of Cherry Mobile’s fifth year anniversary, last week, the company unveiled an exclusive Anniversary Phone touted as The One. 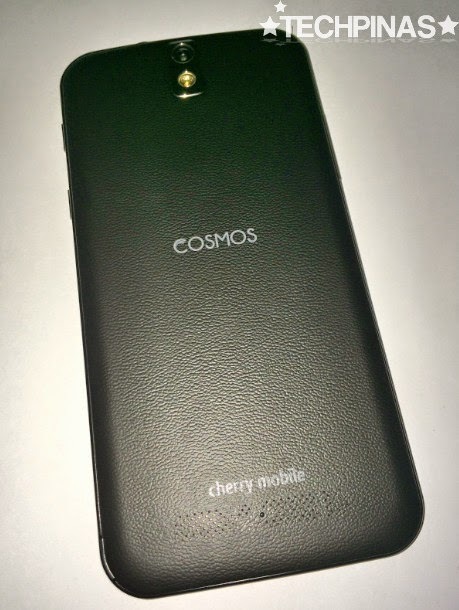 Part of the high-end Cosmos series, the Cherry Mobile Cosmos One - shown in these photos - is a phone that has almost flagship-level technical specifications but dons an unbelievably affordable price. Software-wise, there's an assortment of features such as 'Gesture Sense' that lets you control the phone just by using hand gestures, 'Smart Wake' which allows users to access shortcuts while the screen is off, external storage support via USB On-The-Go, Mobile Anti-Theft security, and other video and audio enhancements. 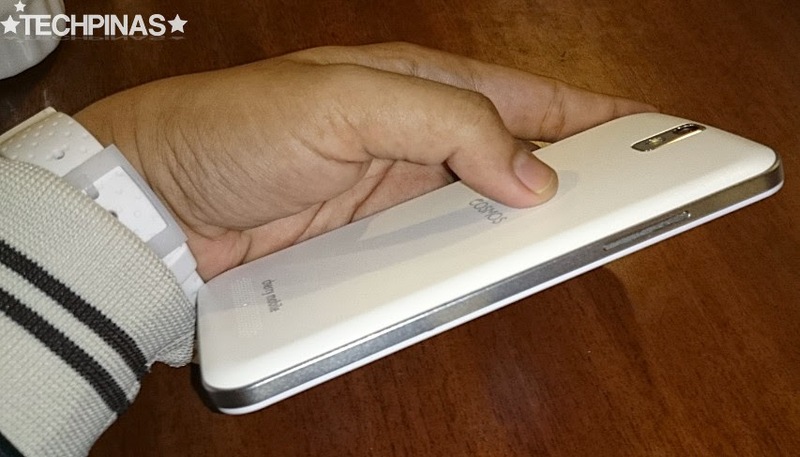 In terms of design, the handset's metallic rim (that's actually just painted plastic -- but it's well done) and the back plate with faux leather texture reminiscent of that of Samsung Galaxy Note 3 give the device an air of corporate sophistication and makes it look more expensive than it actually is. 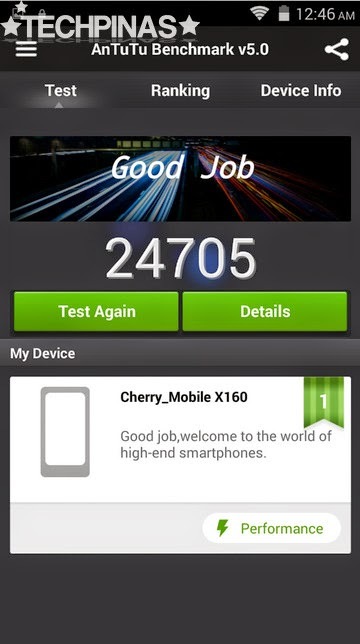 Under the hood, Cherry Mobile Cosmos One is powered by a 1.4 GHz Octa Core ARM Cortex A7 and Mali-450 MP4 GPU based MediaTek MT6592M chipset that's complemented by 1 GB of RAM and 8 GB of expandable storage; The combination of which gives the phone an Antutu Benchmark Score in the area of 24,705 -- just slightly lower than that of handsets running on the regular MT6592 SoC. This mark is well-reflected in the very smooth gaming experience that the phone delivers. This is how the retail package looks. 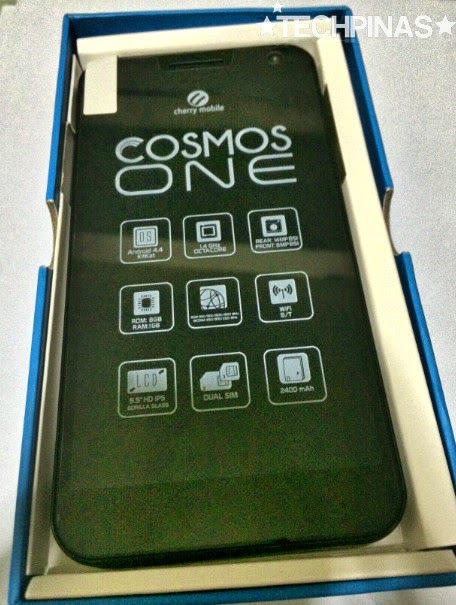 Just like CM's other releases, the handset has this pre-installed screen protector showing the key features of the device. If you ask me, it's a bit redundant and I would really prefer to get just a plain, transparent film. 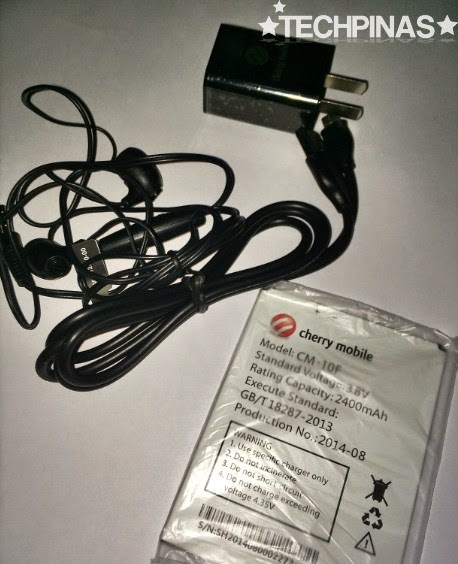 Inside the box, the handset is joined by the 2,400 mAh battery pack, microUSB to USB connector cable, headphones with in-ear silicon buds and microphone, and the travel charger. 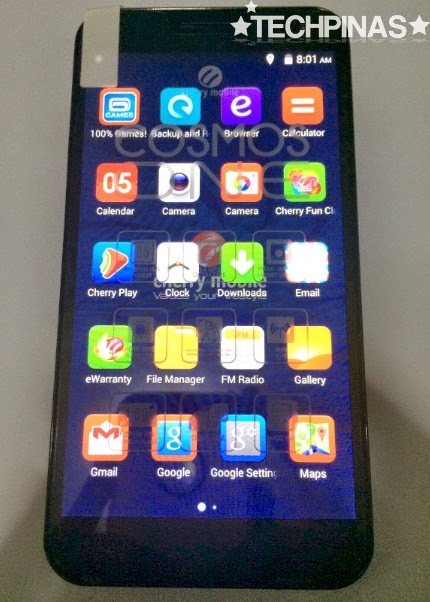 CM Cosmos One features Android 4.4 KitKat vanilla user interface with modified default app icon designs that obviously look like that of MIUI. 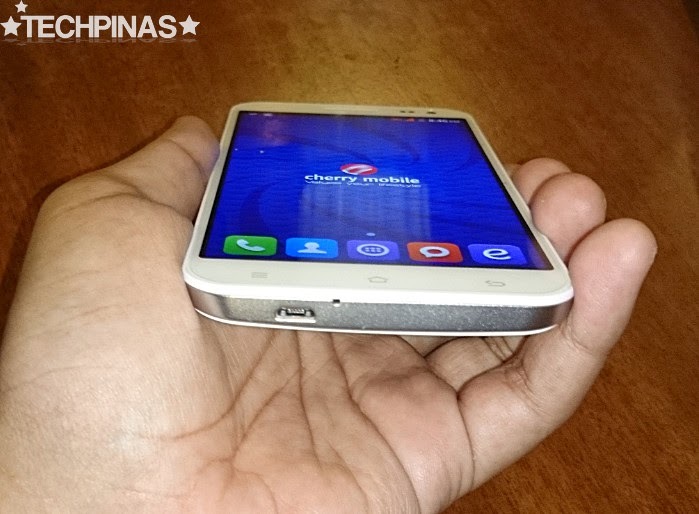 According to our reliable source from the local electronics giant, Cherry Mobile Cosmos One was supposed to go head-to-head with Xiaomi Redmi Note. "We actually thought Xiaomi would release Redmi Note first. But as you know, that didn't happen. They released Redmi 1s instead. Nonetheless, we are happy to offer this device to our loyal fans. Anyway, we still have a number of amazing handsets that are slated for release within the year," he told me. 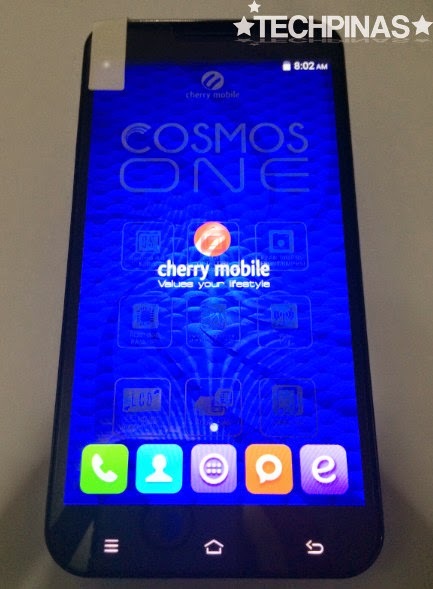 Limited Edition Cherry Mobile Cosmos One became available at twenty CM Concept Stores and Kiosks nationwide via the company's One Day Super Sale that happened last August 30, 2014. But if you weren't able to get it via that promo, don't fret. 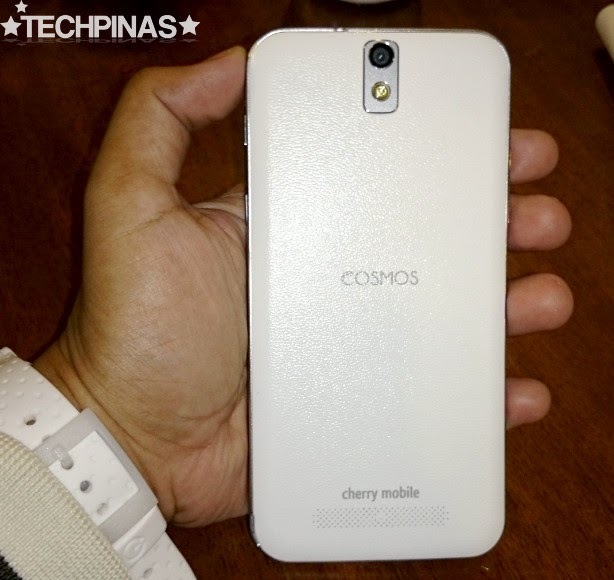 I've just been informed that because of consumers' favorable response to the product, Cherry Mobile is planning to make Cosmos One a part of their regular offerings in the coming days. Stay tuned for updates, TP Friends!